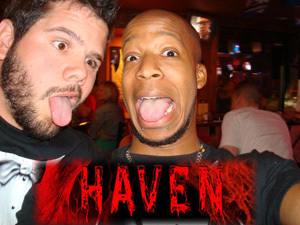 Joining us Saturday afternoon for our Live Chat and Podcast Interview Session on Second Shifters Radio ( http://www.secondshifters.com ) was Haven, a new band on our playlist (thanks to Sanctuary’s insanely gifted ability to find great bands on MySpace) and one that we very much think that you’ll enjoy. Allios Sin from the duo lent his time to us in the chat room, even despite a very long evening the night before, and he brought his voice to us on air as well to help introduce the band’s origins and their music. Quite a blast was had with him and we’re certain that those of you who didn’t get a chance to stop by will too once you download the transcript and the podcast MP3.